As a showcase entry we spent several lessons developing the Maths of perspective drawings of representations of comparisons between Australia and the mission countries- income, death rates, life expectancy etc, and finished by creating chalk drawings around the school for all to see. Both classes gave me strange looks. But with instructions to answer as best they could, the students played along and provided data. Did you note the subtle differences between the two question sets? Jonathan Claydon shows us how to cobble together a document camera using nothing more than a top of the line Mac and iPad. Every lesson should begin by getting [students] to articulate something about what they already understand or know about something or their initial ideas. So you try and uncover where they’re starting from and make that explicit. And then when they start working on an activity, you try to confront them with things that really make them stop. And it might be that you can do this by sitting kids together if they’ve got opposing points of views. So you get conflict between students as well as within. So you get the conflict which comes within, when you say, “I believe this, but I get that and they don’t agree.” Or you get conflict between students when they just have fundamental disagreements, when there’s a really nice mathematical argument going on. And they really do want to know and have it resolved. And the teacher’s role is to try to build a bit of tension, if you like, to try and get them to reason their way through it. And I find the more students reason and engage like that then they can get quite emotional. But when they get through it, they remember the stuff really well. So it’s worth it. Awesome Internetting from the last month. I met Nicholas Patey at a workshop in San Bernardino. He wrote up a summary of some of our work that made him seem like a solid addition to my network. I subscribed to Dani Quinn. My subscription list skews heavily towards North American males and she helps shake me out of both bubbles. She also wrote a post about her motivations for teaching math I found resonant. In her most recent post, Leslie Myint wrote, “Apathy is the cancer of today’s classroom.” Subscribed. I met Chris Duran in Palm Springs. Liked his vibe. Leah Temes plunked herself down at my empty breakfast table in Portland last month and started saying interesting things. Then she told me I should follow her on Twitter with the promise of more interesting things there. With only two tweets in the last week, though, I’m getting antsy. I subscribed to Peg Cagle because she understands the concerns of Internet-enabled math teachers and she also understand the politics that concern the NCTM board of directors. I was interviewed for the New York Daily News about PhotoMath, which at one point in Fall 2014 was going to be the end of math teaching. An interview with some kind of education-related Spanish-language blog. My favorite post of the month was Raymond Johnson’s analysis of NCTM’s difficulties adapting to the present day. John Golden crowdsourced a list of free curricula. Michael Pershan hosted an open comments thread where he had a conversation with himself about the difficulties of carving out a career as a classroom teacher. Tim McCaffrey set up Agree or Disagree, which I hope will produce some interesting fight-starters. Kyle Pearce created the most interesting iBook I have ever seen for math class. It overclocks all the built-in features (video embeds, etc.) and then goes over the top, including collaborative student data displays. Awesome. Not easy. The speaker was well-prepared and knowledgeable. The speaker was an engaging and effective presenter. The session matched the title and description in the program book. Attendees scored each statement on a scale from 0 (disagree!) to 3 (agree!). Attendees could also leave written feedback. At the end of the conference, presenters were sent to a public site where they could access not just their own session feedback, but the feedback for other presenters also. This link started circulating on Twitter. I scraped the feedback from every single session and analyzed all the data. To learn what makes sessions unpopular with attendees. It’s really hard to determine what makes a session good. “Great session!” shows up an awful lot without elaboration. People were much more specific about what they disliked. To shame anybody. Don’t ask me for the data. Personally, I don’t think it should have been released publicly. I hope the conference committee takes the survey results seriously in planning future conferences but I’m not here to judge anybody. There were 2,972 total feedback messages. 2,615 were correctly formatted. 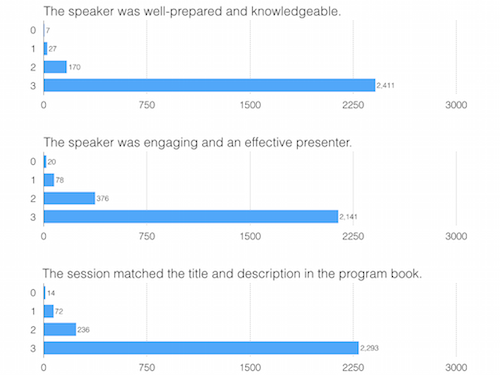 With 3,600 attendees attending a maximum of eight sessions, that’s 28,800 feedback messages that could have been sent, for a response rate of about 10%. How Much Feedback Did You Get? Most presenters received between 10 and 20 feedback messages. One presenter received 64 messages, though that was across several sessions. How Did You Do On Each Of The Survey Questions? Overall the feedback is incredibly positive. 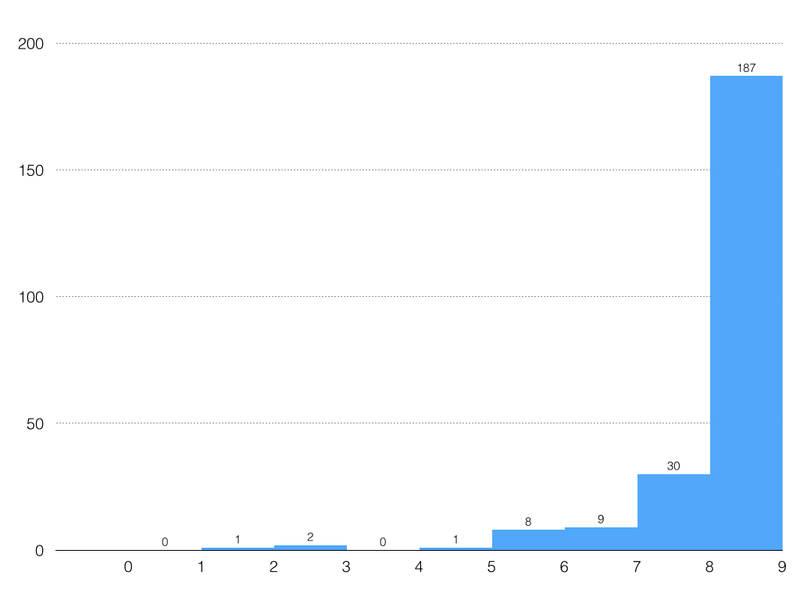 I’m very curious how this distribution compares to other math education conferences. I attend a lot of them and Palm Springs is on the top shelf. California has a deep bench of talented math educators and Palm Springs is a great location which draws in great presenters from around the country. I’d put it on par with the NCTM regionals. Still, this feedback is surprisingly sunny. 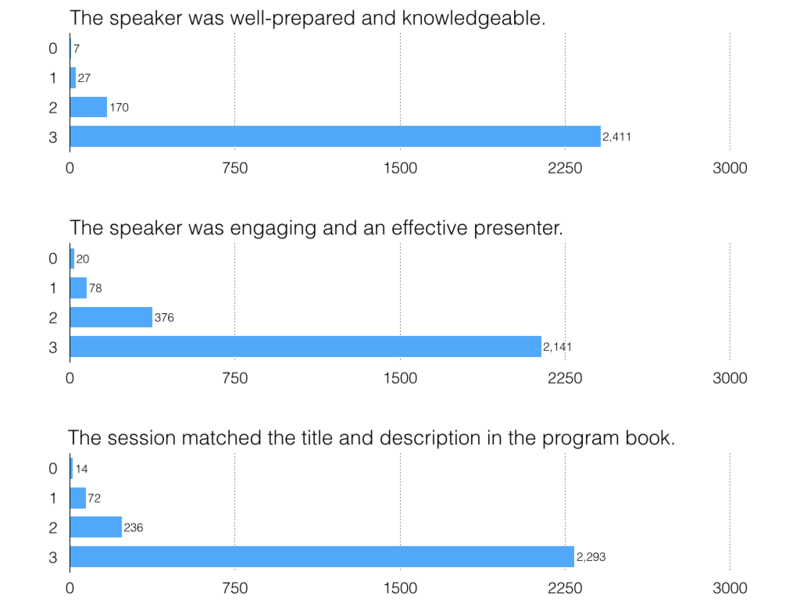 The data also seem to indicate that attendees were more likely to critique the presenters’ speaking skills (statement #2) than their qualifications (statement #1). How Did You Do On A Lousy Measure Of Overall Quality? 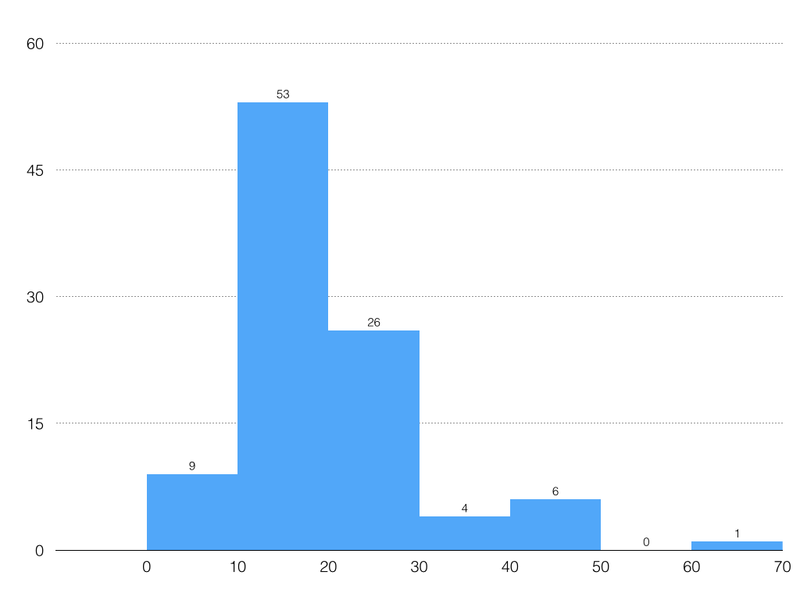 For each presenter, I averaged the responses they received for each of the survey questions and then summed those averages. This measure is problematic for loads of reasons, but more useful than useless I think. It runs from 0 to 9. 62 presenters received perfect scores from all their attendees on all measures. 132 more scored above an 8.0. Even granting the lousiness of the measure, it points to a very well-liked set of presenters. So why didn’t people like your session? The following quotes are all verbatim. he was late and unprepared. frustrating that we spent an hr on ppl sharing rationale or venting. I wanted to hear about strategies and high leaveage activities at the school. A lot of sitting around and not do much. This presentation was scattered and seemed thrown together at the last minute. Unfortunately, the presenter was not focused. There was no clear objectives. Please reconsider inviting this presenter. You didn’t offer enough practical classroom applications. I wanted things students could use. philosophy more than application. I prefer things I can go back with. I already get the philosophy. very boring. Too much talking. I wanted more in class material. BORING. BORING. He’s knowledgable, but dry. Not very interactive. he spoke very quickly and did not model activities. difficult to follow and not described logistically. too much talking from participants and no information or leadership from the presenter. Everyone had to share their story; very annoying. I could do without the justification at the beginning and the talking to each other part. I already know why I’m here. I would have liked more time to individually solve problems. I didn’t think I was going to a math class. I thought we would be teachers and actuall create some tasks or see student work not our work. it would be nice to have teachers do less math and show them how you created the tasks you had us do. The fact that it was a sales pitch should have been more evident. Good product but I was looking more for ideas that I can use without purchasing a product. I was hoping for some ideas to help my kids with fact fluency, not a sales pitch. this is was nothing more than a sales pitch. Disappointed that I wasted a session! I would not have gone to this session if I had known it required graphing calculators. You claimed the wrong grade band. not very appropriate for 6,7 grade. disappointed as it was too specific and unique to the HS presented. Didn’t really match the title and it should have been directed to middle school only. the session was set 2-6 and was presented at grades k-5. this was not a great session for upper elementary grade and felt more appropriate for 7-12. You didn’t connect your talk closely enough to the CCSS. You decided to run a technology session, which is impossible at math ed conferences because half the crowd already knows what you’re talking about and is bored and half the crowd doesn’t know what you’re talking about and is overwhelmed. 23-way tie! Perhaps useful for your future conference planning, however. The revelations about technology and hands-on math work interest me most. In my sessions, I like to do math with participants and then talk about the math we did. Too much doing, however, and participants seem to wonder why the person at the front of the room is even there. That’s a tricky line to locate. I would also like to present on the technology I use that makes teaching and learning more fun for me and students. But it seems rather difficult to create a presentation that differentiates for the range of abilities we find at these conferences. Great, if true. Given the skew of the feedback towards “SUPER LIKE!” it seems the feedback would be most useful for scrutinizing poor presenters, not locating great ones. The strongest negative feedback I found was in reaction to unprepared presenters and presentations that were covertly commercial. CMC has the chance to initiate a positive feedback loop here by taking these data seriously in their choices for the 2015 conference and making sure attendees know their feedback counted. More and more thoughtful feedback from attendees will result. I forgot to tell the attendees at my session my PollEverywhere code. Some people still sent in reviews. My practice is to post my most recent twelve months of speaking feedback publicly. 2014 Nov 4. It seems I’ve analyzed an incomplete data set. The JSON file I downloaded for one presenter (and likely others) contains fewer responses than he actually received. I don’t have any reason to believe there is systematic bias to which responses were included and excluded but it’s worth mentioning this caveat.